*The Roman Republic: The Precursor of the Roman Empire by Duncan Ryan. Price: Free. Genre: Nonfiction, Sponsor, History, Civilization & Culture. 5 stars on 1 Reviews. 168 pages. ASIN: B01LYLSV79. Posted on September 29, 2016 Author KibetCategories Free Kindle History Books, HIstorical, HIstoryLeave a comment on Kindle History Deals for Thursday! 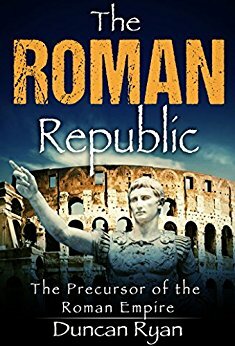 *The Roman Republic: The Precursor of the Roman Empire by Duncan Ryan. Price: Free. Genre: Nonfiction, Sponsor, History, Ancient Civilizations, Rome. Rated: 5 stars on 1 Reviews. 168 pages. ASIN: B01LYLSV79. Posted on September 28, 2016 September 29, 2016 Author KibetCategories Free Kindle History Books, HIstory, WarLeave a comment on Kindle History Deals for Wednesday! The Freedom Fighter: A memoir of a member of the Russian Militia in the War in Ukraine by Vitaly Fedorov. Price: Free. Genre: Military & Spies, Military & Wars, Military, Russian & Former Soviet Union. Rated: 4.2 stars on 5 Reviews. 236 pages. ASIN: B01HZPULXS. Secret Chambers and Hiding Places Historic, Romantic, & Legendary Stories & Traditions About Hiding-Holes, Secret Chambers, Etc. by Allan Fea. Price: Free. Genre: State & Local, Nonfiction. Rated: 4 stars on 5 Reviews. 116 pages. ASIN: B00849OR6M. Posted on September 27, 2016 Author KibetCategories Free Kindle History Books, HIstory, Military, WarLeave a comment on Kindle History Deals for Wednesday!